The Officer is serving as Director General of National Disaster Response Force (NDRF), India’s premier federal specialized force for responding to natural disasters and CBRN emergencies. He is a senior official with the Indian Police Service since 1983. He has vast experience and deep insight into the functioning of law enforcement, security, intelligence and crime prevention, managing mega events and criminal investigation. 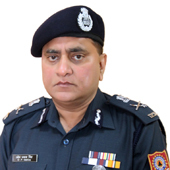 He has also served in various organizations in Government of India such as Special Protection Group (PM’s security), CRPF dealing with issues connected with internal security of the country as well as CISF looking after security of 59 airports of the country. As chief of India’s specialized Response Force, he has led major search and rescue operations in various natural disasters that hit the country in 2014-16. In Jammu & Kashmir urban flood, not only did he galvanize his force immediately, but led the humanitarian rescue operations from the front winning encomiums from local population, State Government and national media. NDRF, under his command, conducted excellent urban search and rescue work during Nepal Earthquake which was appreciated by United Nations at global level and by the Government of Nepal. He prided being on the part of the rescue mission during Chennai Urban Flood in 2015 where NDRF, under his close supervision, saved thousands of human lives. During his leadership position with NDRF, he oversaw a budget of approximately $ 148 million and planned and executed 8 major disaster response programmes benefiting more than 30 million people in India and Nepal. As Chief of Response Force, he contributed towards refinement of Disaster Management Plan, development of capacity building of various stakeholders and conduct of SAADMEx 2015 attended by SAARC countries of the region. The Government of India has awarded him with the Indian Police Medal for Gallantry, Indian Police Medal for Meritorious Service, Police Special Duty Medal, Disaster Response Medal and President’s Police Medal for Distinguished Services. He has received appreciations from the State Government of Uttar Pradesh for excellent service–oriented policing in Ardh Kumbh Mela at Allahabad and resolving long-standing disputes between Shia & Sunnies at Lucknow. He was given Distinguished Leadership Award for Disaster Resilience by All India Council of Human Rights, Liberties & Social Justice on International Human Rights Day in 2015.